My name is Ella, i am nearly 12 years old and I am inspired by art. I love Heidi’s art classes because she makes it so much fun. She is funny and kind. When ever I am having a bad day, art class will always put a smile on my face! Heidi has taught me to concentrate and always try my hardest.. I have improved a lot and she has shown me many helpful tips when I’m painting. I can’t wait to go every week. Thank you Heidi! My family bought me some art lessons with Heidi as a birthday present. I’ve always been interested in painting but time restrictions have held me back. At first I was a bit apprehensive about painting in front of someone else, but Heidi is so easy going and fun to be around that I felt completely comfortable in having a go. It was such a relaxing thing to do. Great music and great coffee helped too. Thanks so much for the experience. The kids and I are really proud of what we achieved in such a short time. 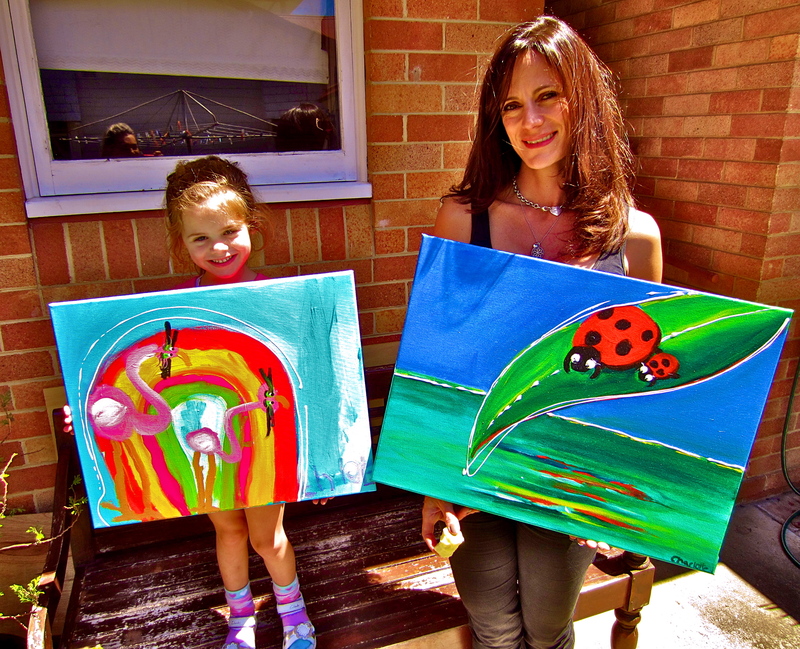 Heidi was very supportive and inspirational in helping the whole family to create our own wonderful paintings. Our pieces are on show at our house and visitors have commented on how impressive they are. Heidi is such a clever artist and she makes even the most inexperienced of painters feel confident. We have had such an enjoyable experience and hope to be back! Painting with Heidi has been a great experience. I moved here recently from overseas, and wanted to start many things anew. One of my goals is to exercise my own artistic flair, something i have quietly gone about over the years on my own. Working with Heidi is showing me so many new ideas, mediums, techniques and an endless amount of possibilities that i have never even thought of. Her studio is very inviting and comfortable, and Heidi is very nurturing and respectful to your ideas. She really helps to guide you and bring about so much more of yourself in your work. I am so excited to continue to learn from her. She is so talented and it is a great honor to be able to work with someone so passionate about the work they do. 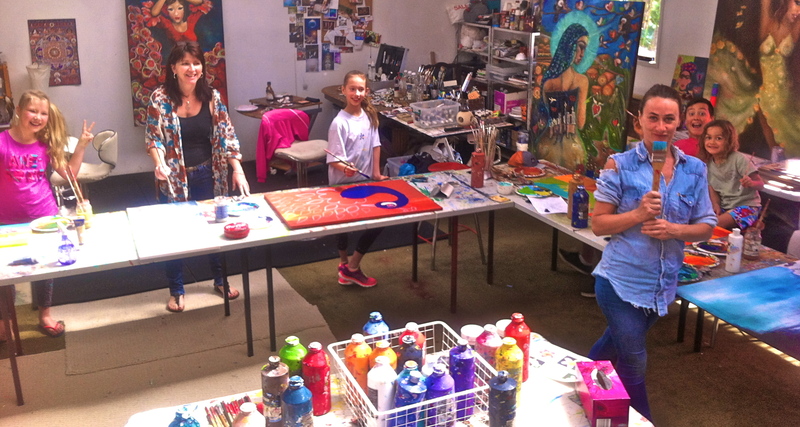 I have recently attended 2 art classes at Heidi Lee Warta’s studio in Dee Why. I decided to try something new with my 2 sons that wasn’t sport orientated. All the materials were supplied and we had a great experience as first time artists. I was amazed with the result after the first week. Heidi made it a really fun experience for all of us. 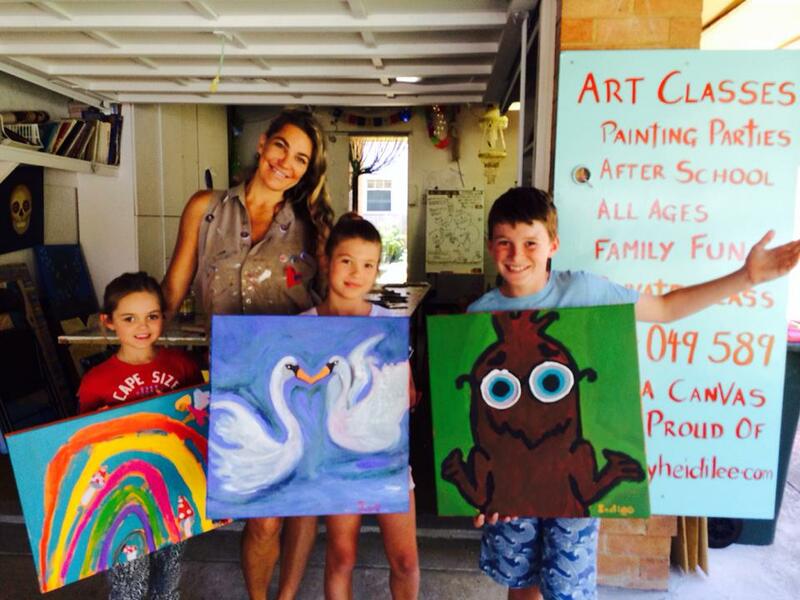 I was pleasantly surprised at what my boys were able to paint with a little guidance from Heidi. We all left with a big smile on our faces and have been continuing the classes since. Heidi Lee is a very talented artist, great teacher and best of all knows how to make a learning experience fun. I just love art classes with Heidi! I took my 3 daughters ages 4,8 & 10 to a class and did the class too. We all did incredible art works with the guidance of Heidi. She was calm, lovely and full of great input. We had such a great time and have been back 3 times all the way from Bondi. Well worth it and money well spent! I highly recommend art with Heidi Lee. Today is a new day and blessed am i for having visited your enchanting home on the web. You are an exceptional soul whose gifts are many. You have a flow of positive energy that touches the lives of people in ways profound. I thoroughly enjoyed everything you put forth on your pages. Know that by sharing the lightness of your being you motivate others to act in kind. Yours is an influence that transforms. Thank you for sharing your greatness. I wish you a journey of great joy that ignites new possibilities. May you guide people towards enlightenment as you live your dreams and May you be receptive to what the spirits have to offer as you share yourself in a way that helps the planet.